NuFlow St. Louis has invested in the newest sewer camera inspection technology to ensure reliable, effective results for every sewer pipeline situation. 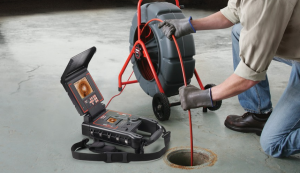 This powerful tool combines a durable, waterproof high-definition camera with fiber optics technology to give our technicians a real-time look at what is happening deep inside your sewer system. Our inspection service is proven to save our customers time and money, providing real peace of mind no matter how difficult the sewer problem may be. Regularly scheduled sewer camera inspections are an essential part of responsible home maintenance. This simple, inexpensive procedure can save you thousands of dollars in plumbing repairs by catching sewer problems early before they have time to advance. Our NuFlow St. Louis technicians are skilled at identifying the early warning signs of sewer pipe deterioration while an easier, less expensive repair solution can still be applied. A one-hour sewer inspection could be the difference between a simple rooter service to clear away tree roots that are just starting to infiltrate and a major sewer replacement project after they’ve crushed the joint and broken the pipe. If damage has already occurred, NuFlow St. Louis’s sewer camera inspection improves the repair process by providing a clear inside look at the inside of the pipe for our technicians. When you call for a sewer repair, we’ll use our high-definition cameras to inspect the pipe interior to locate the cause of the problem. Once we’ve found the culprit, we’ll use the camera to guide our innovative trenchless technology through the pipes. This equipment allows us to complete anything from a minor patch to a complete pipe replacement underground without digging. The camera ensures that we can always accurately diagnose the problem and effectively apply the right solution for effective, long-term results. NuFlow St. Louis sewer camera inspection technology is also helpful for mapping sewer systems prior to landscaping projects or renovations. We can create a detailed diagram of your sewer pipes to help you plan where to place foundations, slabs, walls, trees, poles, and other property features that require digging. It is also useful when running new utility lines. After a short sewer mapping session, you never have to worry about accidentally striking a sewer main during your project. If you are in the process of building a brand-new home or business facility, NuFlow St. Louis can help you with the plumbing inspection process. We can perform a pre-inspection of your installed plumbing or sewer system to help identify potential problems that would be flagged by the city inspector. Rather than risking a failed inspection and construction delays, you can take advantage of our expert technician’s experience and knowledge of local plumbing and building codes to ensure you always pass your city inspection on the first try. We can do both rough-in and final inspections. For a true, firsthand look at the condition of your sewer system, you can count on the sewer camera inspection technology provided by our professionals at NuFlow St. Louis. Our team will fix your sewer problems quickly or prevent them altogether by gathering the knowledge needed to do the job right the first time. Call us today to schedule your inspection service!